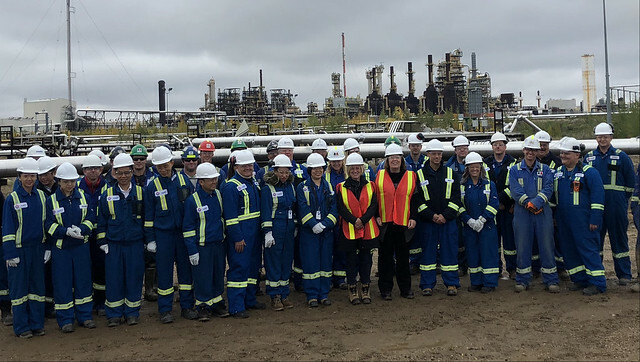 Premier Rachel Notley and Energy Minister Margaret McCuaig-Boyd joined Nexen officials, First Nations enterprises and other local suppliers to highlight a $400-million investment by Nexen. Nexen is a wholly owned subsidiary of CNOOC Ltd.
Premier Notley and Minister McCuaig-Boyd at the opening of Nexen's Long Lake South West project. With leading-edge technology, the Long Lake South West project illustrates that a major oil sands producer can be both an energy and environmental leader while showing a long-term commitment to creating good jobs in Alberta’s energy sector. The steam-assisted gravity drainage (SAGD) production facility expects to achieve first oil production in 2020, and will produce 26,000 barrels per day once it reaches full capacity. This production requires less steam and natural gas on a per-barrel basis, meaning less energy is needed overall for total production. Through these advancements, Long Lake will achieve a 20 per cent reduction in greenhouse gas emissions intensity from current levels by 2025. The $400-million investment in Long Lake South West includes engineering, construction and startup, with more than 90 per cent of this value spent in Alberta. Approximately 250 full-time jobs are expected at the peak of construction, with an estimated $200 million in provincial royalties and property taxes during the life of the project. Contracts for the project are in the process of being awarded, with efforts to ensure continued opportunities for local and Indigenous-owned companies. To date, two major contracts have been awarded to First Nations enterprises and/or other local suppliers. Karl Rudd, president and CEO, AKITA Drilling Ltd.
Steam-assisted gravity drainage is a thermal production technology which uses two parallel horizontal wells, known as a well pair, one to inject steam, and the other to produce water and oil. Initially, steam is circulated in both wells to establish communication between the wells.